Two years ago we built a wooden boundary fence at the back of the property. We had some problems with intruders and at the time it was all we could afford to do. However it has not proved to be as secure as we would have hoped and recently we had an offer of support to pay for a wall. We had built the retaining wall thanks to the generosity of my close neighbours in Cumbria during the previous year making a good foundation. 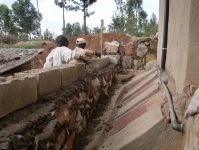 I hope you will find this account of our building work interesting. 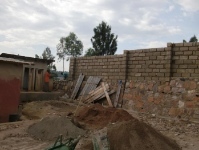 All work here is manual, hauling sand, cement, stones for building mixing cement etc. 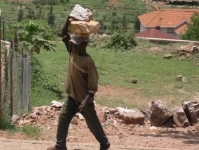 All of Rwanda is hilly; the tons of materials are left on the road outside our property and then hauled, bit by bit by women and men working 8 hours a day. 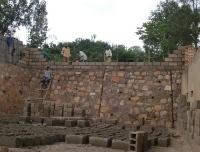 Building blocks are made on site, using a frame and they are left to dry in the sun for three days. The wall was built in 10 to 15 metre sections each day. In places it is very high so a ladder was made on site. 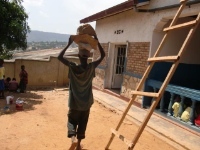 The cement is carried up to the workers in half gerry cans – whatever would Africa do without these? And now we are left with a lot of wood from the fence – people who know me well will smile when I say that we are re-cycling most of it. 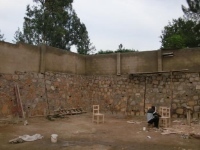 Some Rwandans have been very amused by this idea and the wood would most probably have been burnt – or at least made into other fences. Enter Claude, our very own carpenter. Rwandans have lovely smiles but perhaps his smile is one of the broadest I have seen. Nothing troubles him and he just gets on with the job. 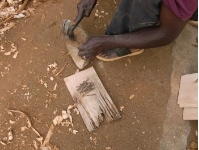 He travels each day about an hour from home on his bicycle and when he takes wood to the wood-yard for planing or gluing he takes it on his bike. 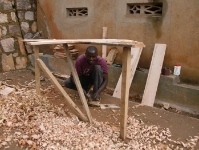 The wood is actually very dense and heavy, hard to work with, but Claude just gets on with it. 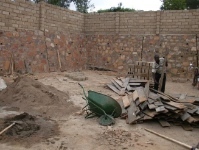 He began by making a work-bench; he dug holes in the ground and constructed it in the back yard. He then prepared the nails which he had taken out of the fence. We had previously broken up the majority of the first desks we had and no longer used as they are not suitable for the way we work. 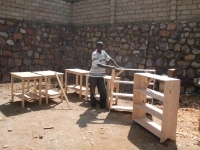 He had made small benches which the children can easily carry around and are very versatile. 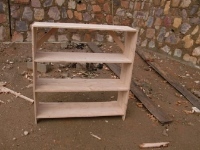 Result at the time of writing : – 34 small benches, 3 bookcases, 11 tables and 15 chairs to come – marvellous!